ProF can be used for various goals. It can be used for evaluation of the curriculum by teachers in the roles of educational designer and teacher in parts of the curriculum. Teachers acting as mentors and student counsellors can use ProF to analyse one student’s strengths and weaknesses. Teachers can look at the progress test results for their discipline and the subjects they teach to see how well students are doing on their subject. Teachers can look at the development of knowledge in their subject domain at group level (reference groups) to determine where in the curriculum the subject is taught, whether knowledge is retained sufficiently and how it continues to develop. 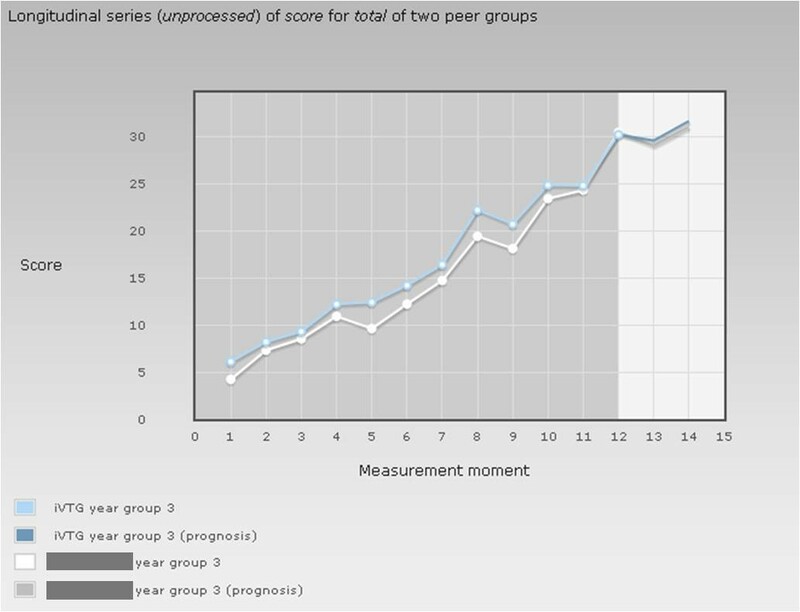 Teachers can also look at the score development of a reference group in a certain year at their own university and compare it with the reference group in the same year at all the participating schools. The score development patterns indicate if there are shortcomings in knowledge development and whether differences are systematic. If there are serious weaknesses in the development of scores, a teacher can decide to look for possible causes and how these might be remedied, and modify the educational programme accordingly. Additionally, teachers can derive useful information from the percentage of question mark answers and the incorrect answers. High percentages (compared to other disciplines) can indicate that questions are too difficult or point to gaps in the educational programme. Scores can be compared momentaneously or longitudinally. When the comparison is momentaneous, the line charts and the column charts (showing the score of the total PGT or the score per subdomain) of the two reference groups are shown side by side. When the comparison is longitudinal, the development of the mean score (50% percentile, the median) is shown (white: own university, blue: iPGT). 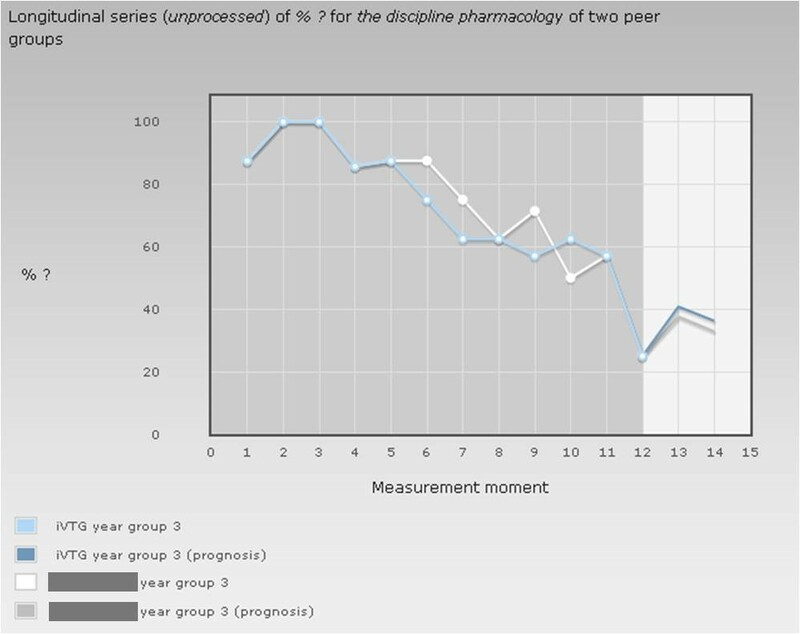 On the right of the chart (lighter background) the prognosis for two future measurement moments is presented. The information in ProF is highly suitable to help students reflect on their knowledge development. The overviews and charts provided by the system can be included in the portfolio and updated continuously. This evidence can make an important contribution to the effectiveness of the portfolio and promote efficient and effective discussions between mentors and students. ProF provides information about a student’s knowledge development in general or on sub domains. In addition, it offers the possibility to analyse the answering strategy. The questions in a progress test (PGT) come with a “don’t know” (?) answer option. Also penalties are given for incorrect answers. The aim is to prevent gambling and stimulate the use of the ‘?’ option if a question is not clear or the subject unknown to the student. Without penalties students (those in the first years, in particular) might be tempted to answer all the questions, because this would bring only gain and no loss. It is generally considered a benefit of the ‘?’ option and the penalties that students in the early years are not tempted to gamble on 90% of the questions. However, it is considered a drawback that progress test outcomes can be influenced by the answering strategy. The problem here is that students who want to be sure before answering a question and are inclined to use the ‘?’ option a lot sell themselves short and may achieve lower scores than students who are less careful. ProF enables students to monitor the effects of their answering strategies. The ‘?’ percentage in the total answers indicates whether a student has used the ‘?’ option more or less frequently compared with the reference group. A relatively high percentage of incorrect answers can be indicative of excessive gambling and/or inability to assess what one knows and does not know. With ProF, student counsellors are able to give specific advice about the answering strategy or knowledge development (on specific sub domains).